Psychologists view well-adjusted behaviour as conformity�the ability to navigate relationships and events within a framework of societal rules and regulations. George Serban argues that a better test is how well an individual is able to navigate adverse situations by handling conformity's ambiguities and incongruities. He uses clinical findings and content analysis to explore the interface between social conformity and nonconformist behaviours. The definition of the normal is itself problematic, since society's expectations are sometimes controversial, arbitrary, or equivocal. 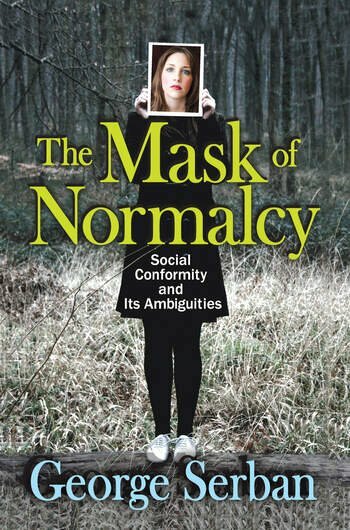 As a result, people who have problems coping with social conformity choose between degrees of nonconformity or hiding under what Serban calls a "mask of normalcy." Further complicating matters is that some nonconformist attitudes are now seen as normal, supported by governmental policies tacitly favouring moral relativism. A multicultural society is crisscrossed by shades of controversial values and mores. New social codes of "correct" conduct blur the distinction between true and false, right and wrong; and social conflict simmers as a result. What society perceives as well adjusted may even change within a society over time, depending on prevailing social values. Some noticeable variations have been within male-female relationships and sexual morality. Serban ultimately concludes that those who have learned how to manipulate social situations are viewed as well adjusted. Those who have not are seen as struggling or maladjusted. 2 Theories of Personality and the Equivocation of "Normalcy"